Originally Brentwood was part of the Applecross parish, then Riverton before being named a parish in 1955. Until 1957, when Regina Coeli church was built, Mass was celebrated in homes. Because of increase in numbers, in 1980 a parish centre was built in Willetton where Mass was celebrated until the parish church of Saints John & Paul was blessed and opened by Archbishop Foley, on 22 December 1985. 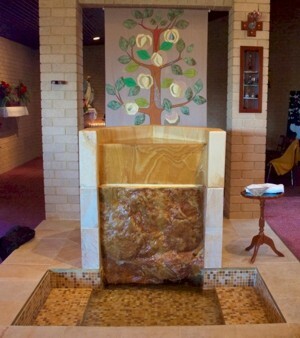 The Jubilee Year 2000 saw the construction of an immersion font for baptism at Saints John & Paul. Carved from a solid block of “Donnybrook Stone” it is a credit to the stonemason’s art. Willetton was the first parish to have such a font.The font allows for the Sacrament of Baptism to be celebrated in two ways, by pouring or immersion. The water continually flows; reminding us that Jesus is the life giving water. An Ambry behind the font holds the three sacred oils used in the church. Each is held within a hand blown glass bottle of different design and colour. Red for the Sacred oil of Chrism, blue for the oil of Baptism, and gold for the oil of the Sick.